Virtual reality, where you interact directly with a computer-created digital world, is not just science fiction anymore. Every Windows version starting with the Windows 10 Fall Creators Update comes with Windows Mixed Reality capability built in, which means you can immerse yourself in digital content, right in your home or office. Mixed reality lets you interact with digital objects as if they were real. A headset provides the sights and sounds, as you walk around amidst your digital content, such as your apps, video, the web, even your regular productivity apps and files, on all sides. The headset tracks your vision and where you move, and handheld controllers let you virtually touch and interact with your digital world. That immersive quality also makes it a fantastic and more personal way to game, since in mixed reality you participate directly within your game’s environment. From golf to interactive puzzles to Minecraft to battles against aliens or zombies, mixed reality puts you right in the middle of your game. Protect your planet from alien invasions in a 360-degree space, using a variety of weapons and tools. In action-packed shooters or duels against giants, use your whole body to dodge attacks and carefully plan out your next move. You don’t just push a button to swing a sword - with mixed reality controllers, you actually swing the sword. Even with the latest Windows version, some computers may not have the technical horsepower for mixed reality – for example, the visuals might not be satisfactory if your computer is using a less-powerful graphics card. A quick way to find out if your computer is ready is to download the Windows Mixed Reality PC Check app, which assesses your computer for you. You will also need a Windows Mixed Reality headset. Visit the Windows Mixed Reality Devices page and check the various headsets and Windows Mixed Reality-ready PCs available. Of course, the best way to check out Windows Mixed Reality and try different headsets is at a store. If you have a Microsoft store in your area, most have a Windows Mixed Reality demo area where product advisors can guide you through a test drive. Then, it’s time to choose your games. There are hundreds of mixed reality apps and games available in the Microsoft Store, and more than 2,000 others available through a collaboration with SteamVR. There are free-to-play games, as well as games for purchase. Keep in mind, though, that you can also play your 2D games with your Windows Mixed Reality system, so nothing can hold you back from having a good time! The newest versions of Windows, starting with Windows 10 Fall Creators Update, include the Mixed Reality Portal, which walks you through setup of Windows Mixed Reality. Find it in the Start menu, or type “Mixed Reality” in the Cortana search box on your taskbar. After setup finishes, an immersive experience teaches you how to get started in the mixed reality world. Then you start in what you could call a home base: a customizable virtual house called the “Cliff House”. 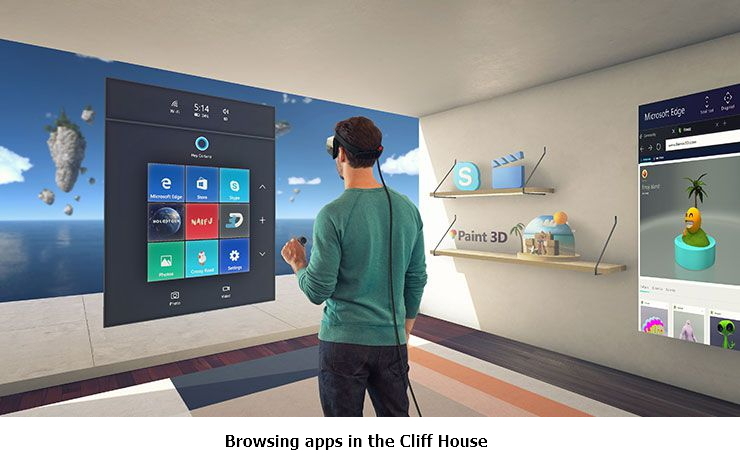 You’ll find all your Windows Mixed Reality apps in the Cliff House, which is also a fun place to get used to the virtual environment. Spend a few minutes opening apps, playing music or surfing the web. You can teleport around the house using your controller and visit each room, the edge of the cliff, or even the roof! At any time within your Cliff House, press the Windows button on your controller to browse applications and games that are currently installed. This includes the Microsoft Store app where you can browse and download other mixed reality apps and games. If you have games that you like to play often, you can even pin them to the wall of your Cliff House, right next to pictures of your family that you can pin using the Photos app! Before you start your game, remember to make sure you have plenty of room in your real-world physical space. Since you'll be in 360-degree action, make sure there are no obstacles nearby, or above you, and no nearby stairs or doorways. 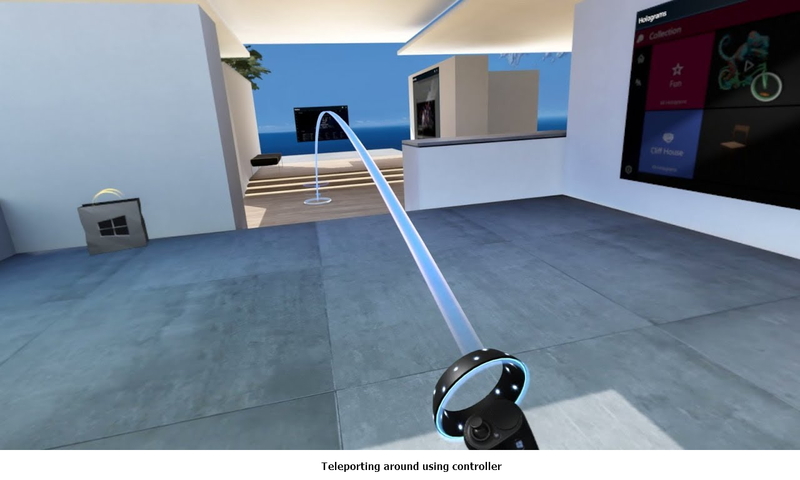 In the Mixed Reality Portal, before starting a game, it's a good idea to set a boundary, which helps the headset alert you if you get close to such obstacles. Open Menu (the three lines at the top left of the screen) and select Run Setup to establish the boundary for your game session. Then, pick a game and launch it, and launch yourself into that world. When you want to stop, use the Windows button on your controllers to return to the Cliff House from within an immersive game. Now you have all the tools you need to create some truly amazing game experiences. Dive in, take off, and teleport yourself into new worlds! It’s mixed reality, so anything is possible!